Written by the lovely Rachel! A girl nicknamed B lives with her racist, abusive father, Todd Smith. 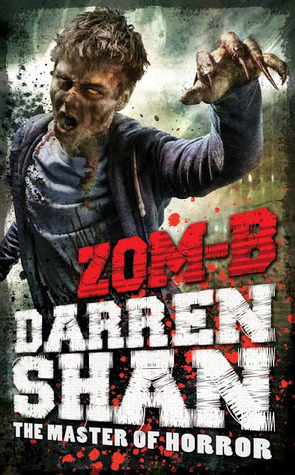 She tries to avoid becoming like him as England – where she lives – explodes into a state of zombie apocalypse. After an excursion to the Imperial War Museum, B saves an Indian baby from being kidnapped by two hooded men. B’s father gets furious at her – he isn’t pleased that she saved someone of coloured skin. Back at school, during a soccer match, zombies break into the building and begin attacking the staff and students. Chaos ensues. B bands with a large group of classmates – including some of her friends – and they begin to defend themselves from having their brains eaten out. Most of the group is killed or turned during their struggle to escape. B’s father comes to rescue them however. During their escape, B chooses to throw a defenceless boy to the zombies. She becomes so overcome with guilt that she returns to the zombie-infested school, rather than leaving with her terrible father, and is killed by a zombie. Prologue: In an Irish town named Pallaskenry. A boy named Brian Barry wakes up screaming. He sees his mother eating his father’s brain. He runs out of the house and sees a man across the street who looks like an owl, he seems immune to the zombies. Brian begs for his life. The man tells him to kneel and pray. Brian does. The man snaps his neck – killing him. Reports of a zombie attack in England comes across the new. Most people think it’s some sort of publicity stunt or hoax, however. The protagonist, B Smith, lives with her mother, Daisy Smith, and father Todd Smith – who is incredibly racist. Todd also suffers for anger management issues and beats both B and Daisy when angered. B struggles to not follow in her father’s footsteps, she really doesn’t want to be racist like he is. At school, B gets into a fight with Nancy – a black girl – after B mocked Tyler. B is sent to the principal, Mrs. Reed, after the incident. Turns out that Mrs. Reed actually agrees with B’s father’s way of thinking, and calls B racist – as if it’s a compliment. B becomes quiet upset at this. On an excursion to the Imperial War Museum, there are many displays on the concentrations camps from Nazi Germany that affect B. She wanders off from her group to think and sees an Indian lady’s baby getting kidnapped by two men in hoods – like mutants. B chases after them, and attacks one. One of the men’s hoods falls down and B sees that his face is rotted. After further confrontation from B, the man throws the baby. B catches it. She is hailed a hero. Todd becomes very angry when he hears that B saved a baby that was Indian. Daisy tries to defend B, and Todd attacks both of them. A few days later, B goes back to school. During a football match, a couple of injured students run into the gym. Zombies follow them. Chaos ensues. B manages to escape the gym with a couple of her friends, Tyler and a (black) kid named Cass. The group tries to escape out a fire exit but find it blocked. A zombie attacks one of the group’s members: Pox. They kill the zombie and escape with Pox. They barricade themselves into a class. Pox himself turns into a zombie. Pox attacks Dunglop and Rick, but the rest of the group manage to run out of the room in time. They head for another exit upstairs but La Lips is attacked. Copper attempts to save her but is bitten. The group continues to try and make its way up the stairs. Cass is attacked by zombies. The rest of the team make it upstairs. Tyler suggests that they go to the kitchen and arm themselves with knives. They head there but find it patrolled by hooded mutants – like the Indian baby’s kidnappers – controlling a group of zombies. They leave and find that the other fire exit is also blocked. They see the principal, Mrs. Reed, eating Jonesenzio’s brain, before she speaks to them. She tells B to stay as she is full foe the time being, but will be hungry soon. Hooded mutants approach. They group runs away again. As they run Linzer announces she is going to hide – rather than run – and the group carries on without her. B smashes a window and jumps out into the courtyard, followed by most of the remaining group. Suze doesn’t want to jump – she is terrified of heights – and Ballydefeck goes back to help her. They are both dragged away by zombies. They see Linzer getting attacked by zombies through another window. Only nine members of the group remain alive. They run through more corridors. Tyler leads them to the front of the building. They are attacked by Pox and Rick (who are now zombies). Someone shoots both of them. They are about to shoot B too, until Todd comes running and stops them. B’s name is revealed to be Becky. The group makes their way out of the building. They find that the fire exit Todd entered the school through is locked. They begin smashing through the door but zombies appear. Todd screams at B to throw Tyler to the zombies, to save them some precious time – remember that Tyler is coloured. B does so after some thought. Tyler is turned into a zombie. The rest of the group make is out of the building. At this point only B, Trev, Meths, Elephant, Stagger Lle, Seez, an unnamed Indian boy and an unnamed Muslim boy are alive. B feels terribly guilty that she “killed” Tyler simply because he was black. She heads back into the building, wanting to take her chance with the zombies rather than stay with her horrible father. She is scratched by a zombie. Tyler attacks her, ripping her heart out and killing her.